Coagh driver Damien Mooney, seen here on the recent Cookstown Targa, took his first Targa win at Loughgall with regular navigator Tony Anderson. After winning the Dungannon Motor Club Moonraker Rally a few weeks ago, Damien Mooney and Tony Anderson showed that they can do it on Targa Rally as well and were delighted winners at the North Armagh Ballylisk Car Sales Rally in Loughgall. Monsoon rain through the early part of the day made it challenging for drivers, but even more so for the officials who had to stand out to marshal the tests and run the timing system. Dungannon Brothers, Jordan and Darrell Burns brought their nippy Ford Fiesta to a class win in the Novice Category and should see them out in semi-experts next time. Tyrone drivers featured at the top of all the Classes on the day with four class winners and two in the runners-up position. For front wheel drive cars, Damien Mooney and Tony Anderson took the honours in Class 1 – Experts, Kenny and Peter Anderson for Class 3 – Semi-Experts, and Jordan and Darrell Burns in Class 5 – Novices. In the rear wheel drive classes, Eric Patterson and Raymond Donaldson were runners-up in Class 2 – Experts, Mark Stewart and Chris Hobson were winners in Class 4 – Semi-Experts, and Eric and Suzanne McIvor were runners-up in Class 6 – Novices. The event didn’t get underway as Damien Mooney had hoped thanks to a slow time on test 1 that left him tenth fastest, and already trailing joint leaders Robert Woodside and Mark Stewart by four seconds. He made up for it on the second test with the fastest time that brought him back level with Woodside, but still a second behind Stewart. Dungannon’s Mark Stewart and Chris Hobson’s MX5 sounded the part at Loughgall and third overall should see them move up into the Experts Class now. Dungannon’s Mark Stewart and regular navigator Chris Hobson would hold the lead for almost the whole of the first loop of tests in their sporty-sounding MX5, and it would be test 8 before both Damien Mooney’s Citroen Saxo and Robert Woodside’s Toyota MR2 would inch ahead of them. Mooney and Woodside would battle it out for the lead for the rest of the day with Woodside having the upper hand until the penultimate test. A slow time let Mooney ahead by four seconds and despite setting fastest time on the final test, Woodside Jr and his MR2 would finish 2 seconds behind the Saxo driver. In the Semi-Experts FWD Class, Kenny and Peter Anderson in their Renault Clio were having a close dice with Robert Whelan and Brian Grady’s Toyota Starlet, managing to keep ahead of the Southern pair until their Toyota let them down. Reliability is the Whelan weak point and they have lost many good results due to car troubles. 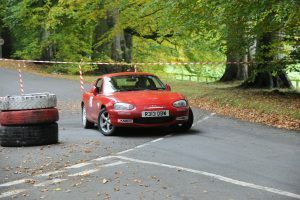 The Andersons would go on to win this class by over a minute from Mark and Alan Gillis’ Ford Puma, and finish a tremendous 14th place overall. Portadown’s Kenny and Peter Anderson brought their Renault Clio to a great win in the semi-expert class in the grounds of Loughgall Forest Park. RWD Semi-Expert Mark Stewart would keep the top pair on their toes for the rest of the day and managed to finish two seconds ahead of Eric Patterson and Raymond Donaldson to finish 3rd overall. This saw them win Class 4 by over 40 seconds, Liam Shaw being second and Drew Wylie in third. 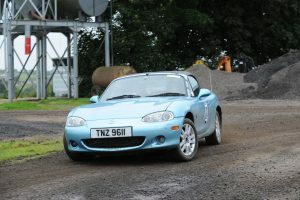 Eric Patterson would finish in second place in the Experts RWD Class, a Class in which 16 of the 17 entrants were all in Mazda MX5s. 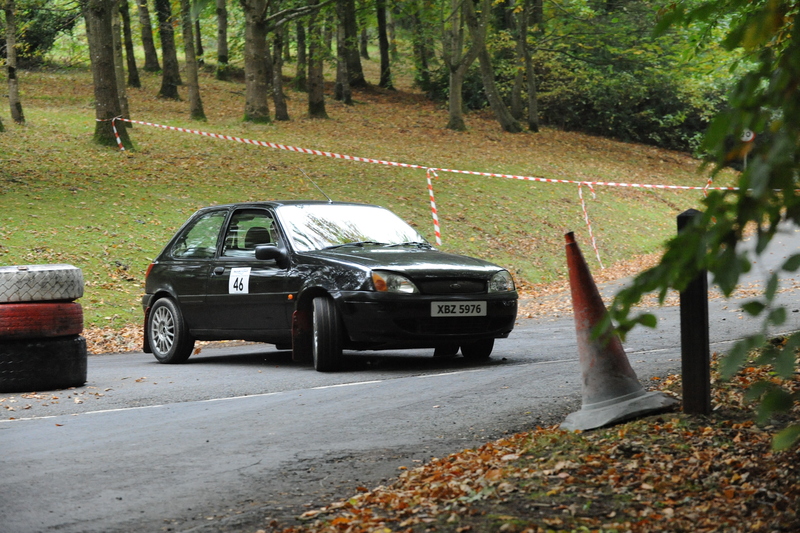 In the Novices section, the FWD class would be won by Dungannon’s Jordan and Darrell Burns in their Ford Fiesta. 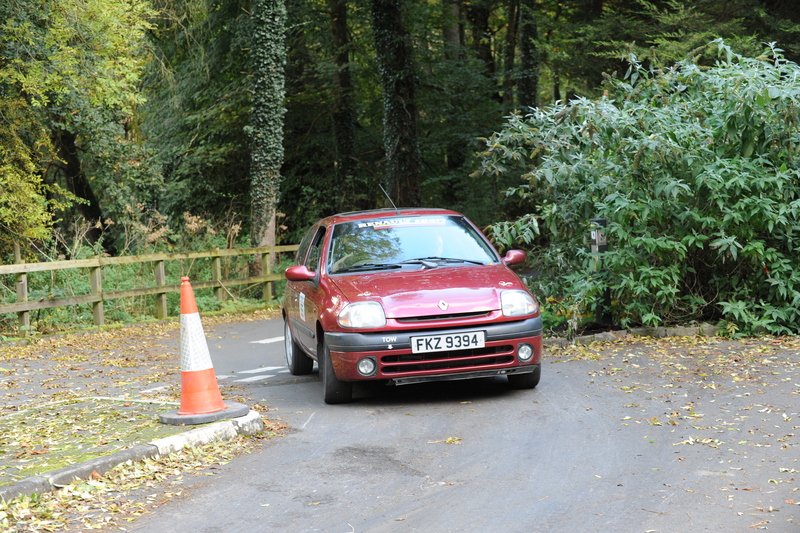 Almost a minute behind were Jonathan Millar and Kenny Nixon in a Citroen C2. 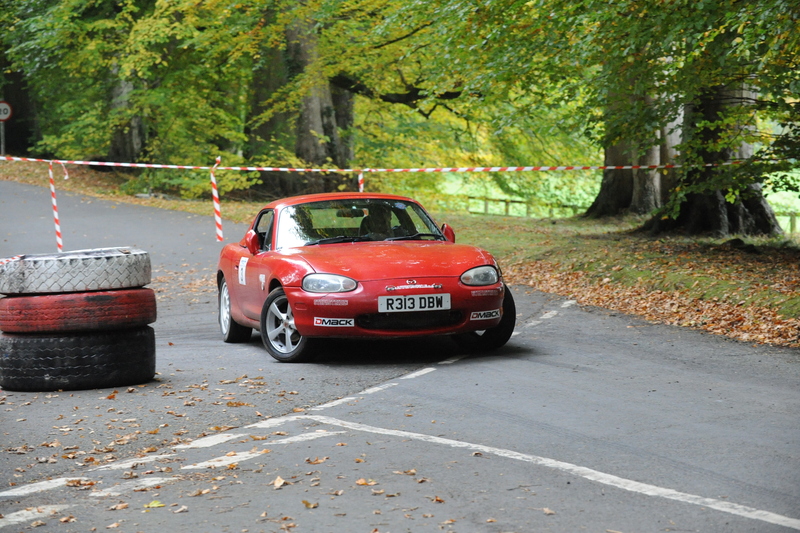 In the RWD class, 29 Mazda MX5’s were entered and 4 Toyota MR2s. 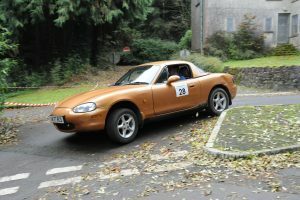 Eric and Suzanne McIvor were the best-placed MX5 in the second slot, just 10 seconds behind the Class winner, Gordon McCready and Rory Mallon in an MR2. Eric had the lead in the class until Test 12, and a slow time on Test 13 put him just out of range of the flying Toyota ahead. On a “Take your Daughter to Targa” day, Eric McIvor and Daughter Suzanne avoided the pylons and took an excellent second place in Class 6. Yet again North Armagh Motor Club had laid on a slick event, built within the grounds of the Loughgall Country Park. The physical closeness of the tests did mean a bit of a wait for competitors after each loop, but most agreed it was worth it for the excellence of the venue. The weather improved as the day went on and the final loop saw little or no rain. Next time, the Targa circus moves to Ballynahinch and District Motor Club for their Autumn Lanes Rally on the 11th November. Local ace Eric Patterson, partnered by Raymond Donaldson, took the runner-up spot in Class 2 and fourth place overall.